It might be hard to believe, but your dog who hogs the bed, wears a sweater in winter, and loves belly scratches descends from ancient wolves. Then again, maybe it’s totally believable when you see what your dog did to your favorite pair of slippers. Regardless, at one point your dog’s ancestors were wild animals who relied on hunting skills for survival rather than a food bowl. This might make you wonder about what you’re feeding your dog. If he has a wild side to him, should you be feeding him overly processed commercial dog food? Food trends for people are moving towards more natural, fresh choices after all. 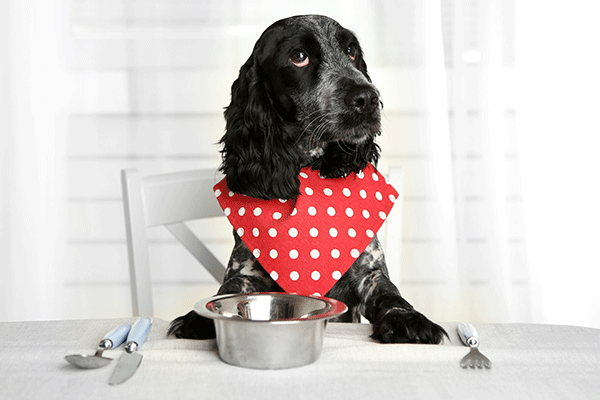 Is there a paleo diet for dogs? It’s called a raw food diet, and depending on who you ask, it can be a healthy alternative diet for your canine pal. A raw food diet is pretty self-explanatory. It’s a diet that replaces traditional dog food with raw meat, bones, fruits, and vegetables. The idea is that these are the foods dogs would eat in the wild if they hadn’t been domesticated by humans, so theoretically they are naturally more suited to the canine body. While there are different ways to implement a raw food diet, the most well-known plan is the Biologically Appropriate Raw Food (BARF) diet. This diet was designed to include all of the vital nutrients a dog’s body requires and eliminate grains and processed foods. It takes the guesswork out of what exactly to feed your dog by breaking the diet into percentages: 70% muscle meat, 10% raw edible bone, 10% fresh produce, 5% liver and 5% other organs. This way you know how much of what foods to buy and feed to your dog to meet his nutritional needs. Like all diets, the purpose of a raw food diet is to optimize your furry friend’s health. Many commercial dog foods are processed and carb-based, which makes them tasty and filling, but not necessarily nutritious. A raw food diet is supposed to give your dog the real nutrients he needs without all the starchy filler and junk. And as we all know, good nutrition is the best foundation for good health. That’s why dogs bred for physical activities like sled dogs and racing greyhounds have long been fed raw food diets. If your dog could use help with any of these, it’s worth speaking to your veterinarian about the option of trying a raw food diet. It seems to have worked for plenty of other canines! While many dog owners have seen benefits for their pooches after switching to raw food, science has yet to definitively prove the diet’s efficacy. Dogs are descended from wolves, but their biology has changed over time so they no longer share the same genetic makeup. Additionally, feeding raw food to your dog creates certain risks not shared by traditional dog food. For instance, raw meat has the potential to carry dangerous bacteria that could make your dog and other animals and humans he comes into contact with dangerously ill. Also, raw cuts of meat might hide dangerous bone fragments that could injure your dog if swallowed. It is also easy for pet owners to miscalculate how much of a raw food their dog should have, which can cause nutritional deficiencies. Some owners just don’t want the extra hassle of meal preparation for their dogs when it poses such risks. Just like human diets, not every diet trend works for every dog. Plenty of dogs maintain good health on a traditional dry dog food diet, and it wouldn’t be remiss of a dog owner to forego the reported benefits of a raw food diet out of concern for the risks it poses. However, if your dog seems to struggle with digesting dog food or has a known condition that could possibly be managed better with a diet change, talk to your veterinarian about switching to raw food. Whatever diet you choose for your dog, he’ll just be grateful he has you to give it to him instead of hunting for it like his wolf ancestors. Curious about what food is best for your dog? Bring your questions to the experts at Academy Animal Hospital and get answers today!